There are over 350 different types of parrots, but not all of them are commonly kept as pets. Some of the most popular pet parrots include African greys, Amazons, and macaws. Pet parrots range in size, and different species have different care requirements, so it is important to do your own research to make sure you can provide optimal care for your parrot. Part of caring for your pet parrot involves providing a spacious cage as well as opportunities for exercise and enrichment. Keep reading to learn more about parrot care requirements and how to shop for the best bird cage for parrots. How Much Space Do Parrots Need? What Else Should You Include in Your Parrot Cage? Pet parrots are often classified by size when it comes to feeding and care. Small parrots include breeds like lovebirds and parrotlets while large parrots include macaws, African greys, Amazons, and cockatoos. Medium-sized parrots include cockatiels, conures, and lories. Caring for parrots takes a significant amount of time and dedication, as does caring for any pet. You’ll need to provide for your parrot’s nutritional needs as well as its needs for a spacious cage, exercise, and enrichment. Different species of parrot have different requirements, so be sure to do your own research before you set up your parrot cage to make sure it will provide for your parrot’s needs. To help you decide what type of bird cage to buy, we’ve assembled a list of the 5 best parrot cages for different species. Keep reading to learn how to choose a bird cage for parrots. The specifics of your parrot cage will vary depending on the type and size of parrot you have. You’ll need to think about cage dimensions as well as the cage shape depending on your parrot’s flying and climbing habits. You also need to consider additional factors like bar spacing and the number of perches. Minimum Cage Size – Small parrot breeds require a cage at least 12x18x18 inches in size while medium parrots require 18x22x24 inches of space. Larger parrots need at least 34x24x36 inches. Width and Height – The dimensions of your parrot cat may differ depending which type of parrot you have. 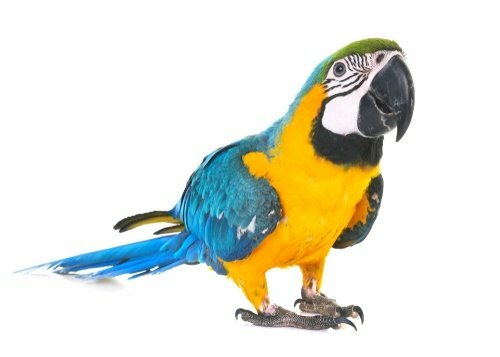 Parrots that prefer to climb need cages that are taller than they are long while parrots that like to fly need a cage that is wider than it is tall. Bar Spacing – The spacing between bars is important, so your parrot doesn’t get a foot or his head stuck. Small and medium parrots should have spacing no more than ½ to ¾ inch while large parrots can get by with ¾ inch to 1-inch spacing. Perches – Most parrots need at least two perches, ideally of different sizes and texture. The more parrots you have, the more perches you’ll need and having an extra or two is always good. Keep reading to see our top 5 recommendations for the best bird cages for parrots. Remember, different parrots have different requirements when it comes to care and cages so make sure you choose the right option for the type of parrot you have. You’ll need to think about factors such as size, dimensions, and materials when shopping for a parrot cage. 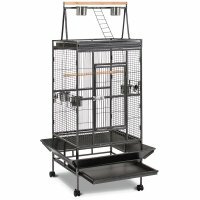 If you’re looking for a parrot cage made from ultra-durable materials, the Prevue Pet Products Wrought Iron Select Bird Cage is a great option to select. This bird cage is made from heavy-duty wrought iron, so it is built to last. It features a push button door lock to keep your parrot secure with the addition of a perch on top of the cage. It comes in four sizes to accommodate small, medium, and large parrots and it is also available in a wide range of colors with a powder-coated finish. 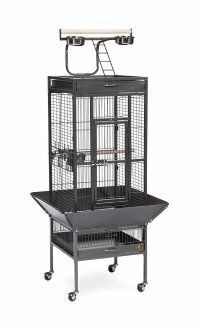 For medium-sized parrots like cockatiels and conures, this Yaheetech Wrought Iron Rolling Large Bird Cage is a great option. It measures 25x25x61 inches and features a premium iron frame with a non-toxic powder-coated finish. This bird cage has a unique design with a slide-out tray for easy cleaning as well as a ladder and wooden perch on top for extra space. Plus, it is on wheels so you can move it as needed. Parrots need a lot of exercise, and sometimes their regular cage isn’t enough. This Prevue Hendryx Wrought Iron Flight Cage is a great option for smaller parrots as a flight cage, or it can be used as an everyday cage for several smaller parrots or a pair of medium parrots. This cage is made from durable wrought iron and features a pull-out grill and tray as well as a storage shelf under the cage. It comes in two sizes and is surprisingly affordable for the size and construction. 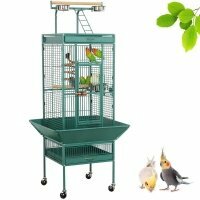 If you’re looking for an affordable option in bird cages for small parrots like lovebirds, this Vision Medium Bird Cage may be a good option. 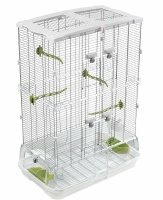 This cage is affordably priced under $75 and is made from durable materials and measures 24x15x34 inches. The cage itself detaches from the base for quick and easy cleaning, plus the debris guard keeps waste inside the cage instead of all over your floor. This cage also comes in different sizes and dimensions for other parrot breeds. Bird cages for large parrots can be expensive, but this Best Choice Products Durable Bird Cage is an affordable option priced under $150. This cage is made from ultra-durable materials with a unique design that features an angled seed guard and a slide-out metal tray. It comes on four wheels for maneuverability and features a ladder and perch on top of the cage. It is ideally sized for medium-to-large parrots as a daytime cage or as an extra-large cage to accommodate flight in smaller parrots. All parrots have minimum requirements when it comes to space, but it is always better to choose a larger cage. Buy the biggest cage you can afford, as long as it meets those minimum requirements. Small parrots require a cage at least 12x18x18 inches in size while medium parrots require 18x22x24 inches of space. Larger parrots need at least 34x24x36 inches, ideally more. In addition to the cage itself, you’ll need to provide your parrot with perches, food/water dishes, toys, and possibly a nest box. Provide at least two perches per bird, making sure to include different sizes and textures. Food and water dishes can be one per bird or per pair and should be cleaned daily. Toys for parrots come in all shapes and sizes, so try a few to see what your parrot likes best. When it comes to buying a parrot cage, you’ll need to do some research about the type of parrot you want before you start shopping. Different parrots have different needs, so it’s important to know what those needs are ahead of time so you can choose a bird cage that meets them. If you’re not sure where to start shopping for a parrot cage, try one of our top 5 picks reviewed above!